Today I want to share a super simple and cheap DIY project that I’m hoping will make life a little easier for me and Jeth (and maybe you, too). It’s no surprise that adult life comes with lots of to-dos and deadlines, and even though I’ve been picking up paychecks and paying rent for years now, it’s not unusual for me to remember to pay rent the day after it’s due. I guess the first step in staying on top of these things is to have a schedule. For us, it works to pay all of our utility bills on the same day, which is usually right around the time rent is due. Trips to the bank happen at the end of the week, as does grocery shopping. Jeth and I are trying to share the responsibilities of keeping track of paychecks, whether or not the credit card bill was paid, etc. This is where things get a little trickier. I am a little OCD or something when it comes to letting other people handle what I think are “important” things, and I knew that even if he took over something like paying bills, I would still end up keeping track of when they’re due and double checking that they got paid. Someone’s got trust issues. Anyhow, that brings me to our current scheduling solution. With some clothespins, paint, craft glue, and magnet strips, I made up a 6-day (Friday-Saturday) calendar that sticks to the back of our front door (or maybe the fridge, when we clear some pictures from it). By the way, in all my years of living, how have I never thought of using a metal door for hanging magnets? At the beginning of each week, we will clip up the things that need to happen on each particular day. When the task is done, the slip of paper gets removed and put in either the “next week” clip for things that recur weekly, or the “next month” clip for things that only happen once a month, so that they’re easy to find when we’re putting up the schedule later on. This way, we can see at a glance what needs to happen every day, and my neurotic tendencies can be satisfied when I see an empty clip at the end of the day – knowing that the bills did, indeed, get paid. 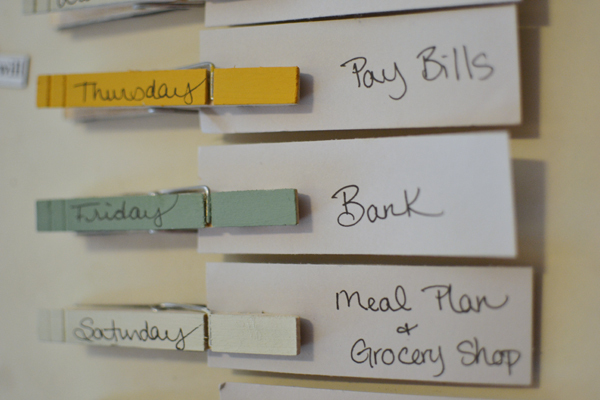 How do you keep track of your family’s schedule and to-do’s? Any creative solutions to share? 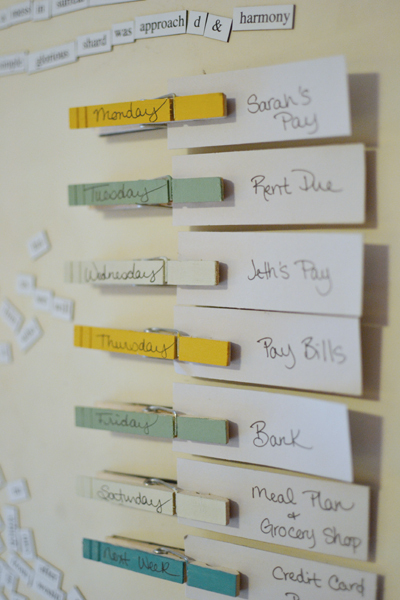 Tags: budget, DIY, organization. Bookmark the permalink.